On the footsteps of the already existing model, the new Joker Boat 28 represents the natural evolution of those concepts of elegance, comfort and uniqueness that have always identified this unit. The deck layout has been reviewed to ameliorate the seats arrangement. The wide stern sofa has a more comfortable reclining backrest that enlarges the available solarium surface. The dinette area at stern can turn into a relaxing sunbathing area by the use of the wooden extension and cushion (a total surface of 2,6 mq with the OPT stern sundeck installed), or can be used as a living zone, thanks to the convenient teak table. The driving bench has a new kind of bucket seat that results much more embracing, so perfect both for piloting and as a back support for the seats towards stern. The console lines are more modern than the previous ones, even if the spirit and essence of the 8,5 mt Clubman is still visible. A classy soul that can be recognized in the pronounced and appealing features that enhance the main characteristics of the unit, without misrepresenting its well-known image. The helm station presents a handy layout, perfect to install all the navigation devices required by the end-customer. The front area has a total sunbathing surface of 3 mq. A comfy upholstered cushion, built-in the lines of the console, creates a convenient chaise longue integrated with the bow solarium. The lower deck space reminds of the previous Clubman 28 layout and includes a marine toilet with hatch. Among the STD equipment: deck cushions, septic water tank, fuel tank (lt 400), shower (lt 120), stern platform with flexiteak covering, seastar hydraulic steering, electric winch. The list of equipment is really rich: radio with 4 loudspeakers, stern additional sunbathing kit, bimini, a-frame, console and bench cover. The max power of twin 250HP is installed, and the boat supplies you a fantastic experience. 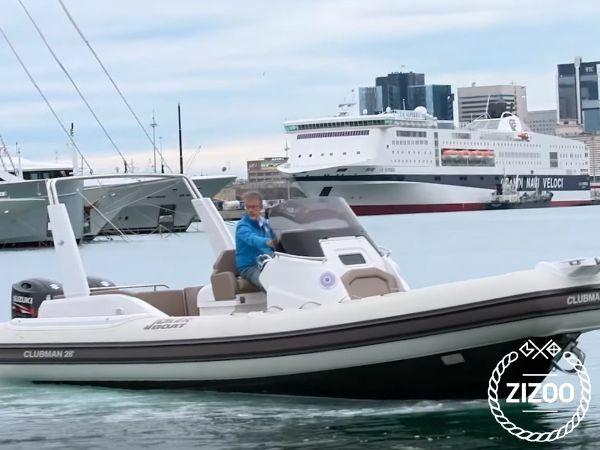 The new Clubman 28 is the result of the wise evolution of all concepts and solutions that have always featured the Joker Boat 8,5m rib, a milestone in its category in matter of comfort and performance. The NEW Mercury Verado V8 Twin (500 HP) outboard engine is the winner of multiple international awards and compliments this boat exceptionally well. Fans of high-powered engines are guaranteed to be satisfied with its wide power band, responsiveness and speeds of up to 55 NM. The engine is equipped with the latest technology, allowing you to cruise at an optimal and fuel-efficient speed of 30 NM/h, with the engine’s fuel-consumption rate at approx. 1 lit/NM. The engine has been tested, is reliable and runs silently and confidently. The boat is suitable for water-skiing, tubing and visiting remote beaches. The Joker Boat Clubman 28 + Mercury Verado 250 Twin is ideal for those who long for something more. The boat has all the necessary permits and all the mandatory equipment. Mandatory equipment: Ropes, Anchor with chain and rope, Boat fenders, Paddles, Mooring hook, Life jackets (for kids at costumer’s request), First aid kit, Fire extinguisher, Manual air pump, Compass, Bilge pump, Radio USB, Electricity 12 V, Bathing ladder, Additional fuel tank (20 l), Deck shower, Flags, GPS Simrad 9, Bimini top. Additional equipment: Tube and skiing lifejacket: 30€/week, Waterski and skiing lifejacket: 50€/week, Wakeboard and skiing lifejacket: 70€/week, Banana for 7 persons: 100€/week. Sehr einfache schnelle Buchung + guter Service in der Marina.